The top headlines from last week include the schedule being release for the Commonwealth Games in Australia, where women’s rugby will be making it’s debut. England’s premiership semi-finals took place and Bristol and Aylesford Bulls came out on top, they will face off for the Championship on April 23. World Rugby released tickets for the upcoming Women’s Rugby World Cup in Ireland as well. As a reminder, we are doing weekly posts recapping the top women’s rugby news. Can’t wait a week? Join us on Twitter or on our Facebook page as we will be posting daily. Springbok Women’s Sevens coach Renfred Dazel was crushed after his side succumbed to Japan 22 – 10 in the final of the World Rugby Women’s Sevens Series Qualifier. Dazel attributed the defeat to errors at crucial times. “It is very disappointing not to qualify for the World Series,” Dazel said after the match. “A victory would have put our system in a better position. However, the ladies did their best and I cannot fault their effort. Bowdoin traveled to France and Spain for their annual Spring Break Tour (sixth year). The Polar Bears played two matches and won both. They emerged victorious over Club Esportiu Universitari (CEU) Rugby Club, which includes players from middle school to college, winning the match 32–27 in Barcelona. The team also beat the Universitaria Esportiva Sanboiana (USE), which is composed of graduate students and is the oldest rugby club in Spain. Women’s Rugby will debut at the Commonwealth Games on Australia’s Gold Coast from April 13-15, 2018. Men’s rugby has been included since 1998 when it was added to balance out women’s netball. It’s expected to be an eight team event including Australia, Canada, England, Fiji, New Zealand, South Africa, Kenya and Wales. USA Rugby is searching for a Chief Development Officer who will lead the fundraising efforts of USA Rugby. Apply today! Flanker Paula Fitzpatrick looks back at Ireland’s historic 17-14 victory over New Zealand at Women’s Rugby World Cup 2014 in Paris. Can the Irish repeat that form as hosts of this year’s tournament? Scottish Rugby launched an ambitious campaign designed to change perceptions about women’s rugby and increase participation levels in all age groups. The launch of #BeTheBestYou could not have come at a better time; the senior women’s team had their best 6 Nations for some years, winning their first match since 2010 by defeating Wales and then following that up with a victory against Italy to leave them sitting in fourth place in the table at the end of the tournament. It was not only the victories that were encouraging though, the team’s performances were greatly improved from previous tournaments. World Rugby continues their trophy tour ahead of the August WRWC and this week they stopped at Portumna Rugby Club. Bristol and Aylesford Bulls both reached the final of the Women’s Premiership for the first time after play-off victories yesterday. Bristol defeated Saracens 43-10 at Cleve RFC thanks to two tries apiece for Poppy Cleall and Claire Molloy as well as further scores from Clara Nielson, Kayleigh Armstrong and Chantelle Miell, while Amber Reed kicked 13 points. Lotte Clapp and Bryony Cleall scored tries for Saracens in the latter stages. In the other semi-final at Cooke Fields, Aylesford came from behind to beat Lichfield 22-15, with tries from Vickii Cornborough, Jess Wooden and Manuela Furlan, while Lichfield scored two tries of their own through Jennifer Maxwell and a penalty try. 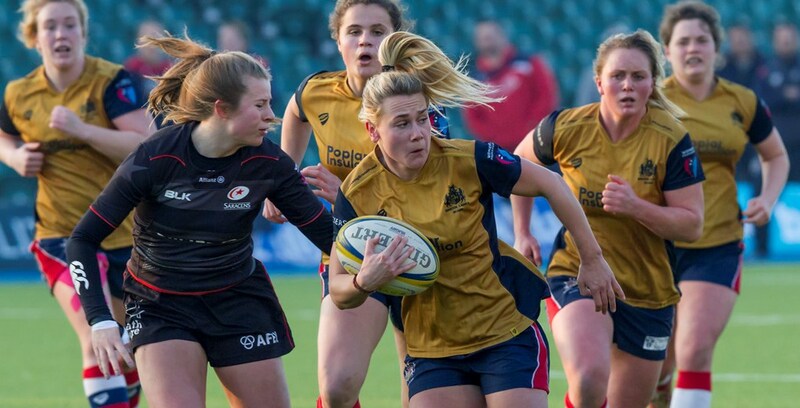 The Women’s Premiership finals take place at Sixways Stadium on Sunday 23 April with Lichfield taking on Saracens in the third place play-off (kick-off 1pm) before the final at 3pm. Ireland’s Director of Women’s and Sevens Rugby, Anthony Eddy, has confirmed the Ireland Women’s Sevens squad to compete at the fourth stage of the HSBC World Rugby Women’s Sevens Series in Kitakyushu, Japan on Saturday, April 22 and Sunday, April 23. The new additions for Kitakyushu are Kim Flood, Louise Galvin, Katie Heffernan and Emma Murphy. The 19-year-old Heffernan from Mullingar could make her World Series debut in Japan, having won her first senior Sevens cap last summer at the Rugby Europe Grand Prix Series in Malemort, France. Get your tickets for the 2017 Women’s Rugby World Cup!! Swansea University edged out Cardiff University 18-5 in the first Welsh Varsity women’s rugby match to played at Principality Stadium. Jessica McCreery, Emma Hennessy and Lydia Shelton scored the tries for Swansea with Cardiff’s only score coming from flanker Eve Jones.